That’s short for Bob Marshall Wilderness and neither of us have ever been there. Next Monday we’ll mount our ponies and head into camp. Hunting wilderness is the ultimate experience. The game may be scare and the hills rugged, but the hunt will be pure. Don’t know what to expect, but that’s part of the adventure. Right now I’m just trying to figure out my ammunition. My favorite big-game rifle and most versatile is my 300 WSM. On my last trip I used Federal premium ammo, 150 grains for pronghorn and on prior trips for mule deer I’ve used the same. These rounds have been very effective and I have no complaints to register. However, on this trip we’ll be hunting elk, along with mule deer and the outfitter recommends a heavier bullet, so I’ve purchased two types of Federal Ammunition. First I picked up a couple boxes of Federal Ammunition at Cabela’s while passing through Reno last August. At $32 per box, the price was reasonable, but it wasn’t the price that sold me, it was the fact that, as I recall, Federal “POWER-SHOK” was the only 180 grain 300 WSM ammo they had in stock. Now I’m through with pronghorn, and ready to re-sight my rifle. So, a few days ago, I began reading up on the “POWER-SHOK” cartridges and I haven’t been positively impressed by the reviews. My reaction was to go downtown Livermore and try to find something possibly more reliable. My shopping produced Federal Premium ammunition called VITAL-SHOK. Now I’m “Californiatized” as the only ammo they had in the store was tipped with copper bullets. For $63 plus tax I purchased a box of 20 180 grain cartridges with all-copper Barns TRIPLE SHOK X bullets. Tomorrow I’m heading to the ranch to fire a few rounds of this ammo to see if I can be comfortable with it. If all goes right, I’ll be ready to go after test firing a few rounds. If all goes wrong, I’ll be doing more research, as I don’t want to arrive in Montana not knowing if my bullets will go where I want them to go and kill what I hit, without demolishing the meat. When I lived in Fremont, I used to lease a Cargill-owned salt pond near Union City, probably close to, if not the same ponds that are now available for public access. I considered it a good outing and it’s possible to bag some ducks – an urban adventure. We brought home widgeon, shoveler, lesser scaup, golden eye and once we bagged a couple honkers. I’d say some type of boat is an advantage, but watch out for the mud. Once the rain starts, the roads are a real mess. In 1995, I wrote an article about hunting the salt ponds and it was published in California Game and Fish. They titled it Bay City Ducks. Reviewing that article brings back memories and a few suggestions. 1.) Don’t worry about rising early for salt pond ducks, but you may need to get there early to get in. 2.) Be careful with your shotgun. Clean it well after the hunt. Salt is hard on metal. 3.) A small boat is best as you may have a workout getting it out there. 4.) Even when privately leased, I found the blinds closest to the bay to be the best producers. 5.) Bring your sun glasses. It’s wide open water. 6.) Bring your dog if you can, it will save time retrieving ducks. 7.) When you knock down a swimmer, you’re in for a chase. 8.) The wide open water begs for as many decoys as possible. 9.) Don’t try wading. The mud is very ugly. This is just an outing. It’s not as good as duck hunting gets, but it’s way better than mowing the lawn. The California Department of Fish and Wildlife (CDFW) is offering waterfowl hunting at Eden Landing Ecological Reserve (ELER) in Alameda County. The reserve is composed of former industrial salt ponds, which is now managed for wildlife habitat by CDFW as open water ponds. ELER will be open for up to 100 waterfowl hunters on the dates listed below. Hunters will be permitted on a first-come, first-served basis for each of the one day hunts. There is no fee for these hunts. Saturday, Nov. 23: Check-in at 5 a.m.
Tuesday, Nov. 26:	Check-in at 5 a.m.
Saturday, Dec. 7:	Check-in at 5 a.m.
Thursday, Dec.12: Check-in at 5 a.m.
Saturday, Dec. 21: Check-in at 5 a.m.
A snow flurry hit about the time our plane landed in Hayden Airport. I met one of the guides and the other two hunters as we waited to gather our luggage. It was about 10:30 PM, the night before the opening of pronghorn season. Not a problem, as there were plenty of antelope. My guide John and I checked out the main hunting territory by climbing to the top of a ridge and glassing in all directions. Within an hour we had spotted twenty or thirty antelope. In addition deer were abundant. They stood out against the snow-covered landscape. My best guess is that we saw four or five legal antelope in the morning, but nothing that inspired me to take a shot. We didn’t harass them at all, in fact only one antelope spotted as best I recall, and that one we approached to check it out better. After lunch we checked out another property and then returned to the ridge and resumed glassing. 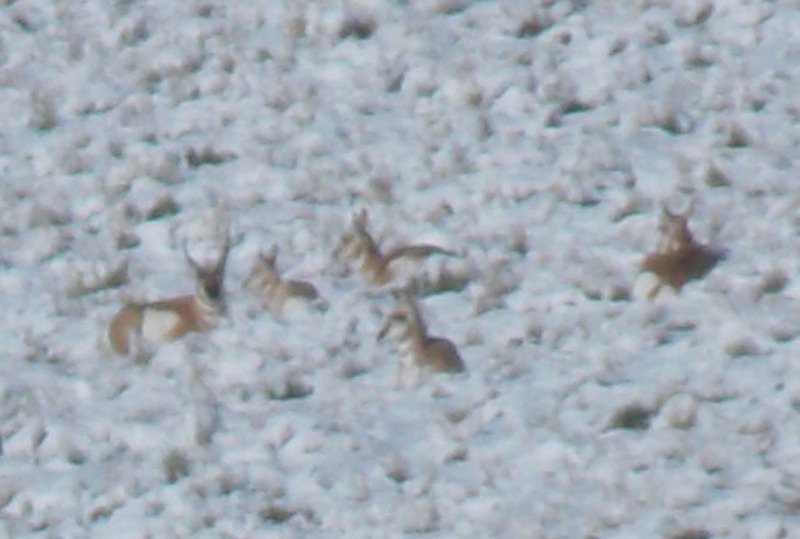 One small group of pronghorn was in a good position for a stalk, so we checked them out from about 125 yards, but elected to leave them alone for the time being. 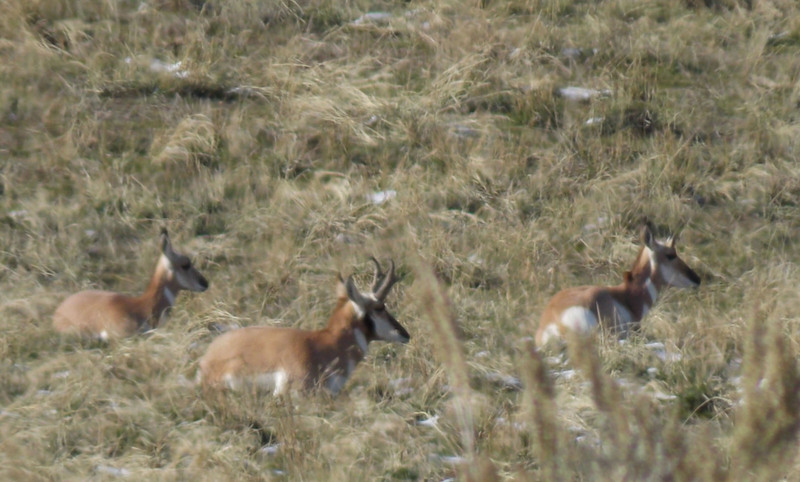 We first spotted this group of pronghorn in the morning before the snow melt began. In the afternoon, the snow was disappearing. Here’s how they looked from 125 yards. John and I took turns using the spotting scope attached to my shooting sticks. The sticks worked well for spotting, photographing and shooting. Here’s John using the sticks and spotting scope. As the afternoon progressed, John decided we should be more aggressive and check out a few nooks and cranny’s. We found more antelope. We found a couple bucks that I wasn’t sure about. Figured they would probably be around later if we didn’t find anything better. I didn’t need the encouragement. I was already getting ready to shoot. From 250 yards I hit him, but he didn’t go down. Then I missed him as he was walking away. At 284 yards, I fired, and he dropped – not moving again. The shooting sticks were quite valuable. Late on day one, my guide John led me to this buck. I was quite pleased. On day two, I joined our outfitter, Eric Hamilton, and two other guests, Ken and Ray. We checked out another property where Eric was able to lead Ray on a successful stalk. 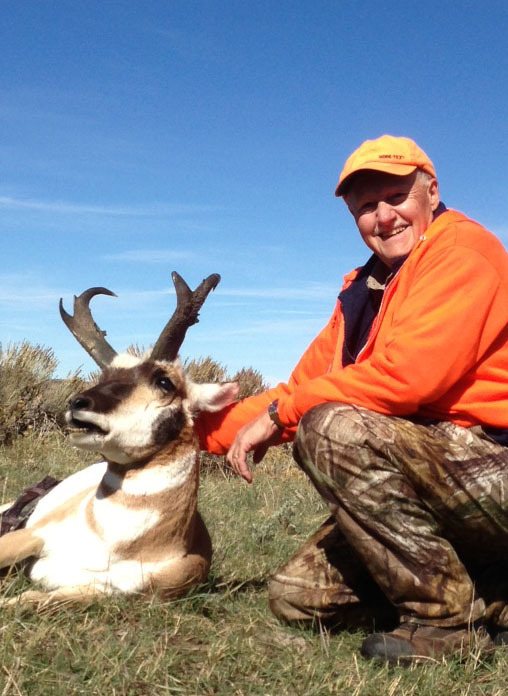 From 125 yards, Ray waited for his pronghorn to stand up. Finally Eric let out a yell and the buck was on his feet. Ray had not trouble making a perfect heart shot. Ray shot this buck on day two after a nice stalk along a ravine. The hunt continued as Ken still had an unfilled tag. The county was broken, but not rough. The hills were covered in varieties of sage and other good feed. Grass and forbs were prevalent. The recent rain and snow was producing new growth. We stopped near a raptor sitting on a sage bush. 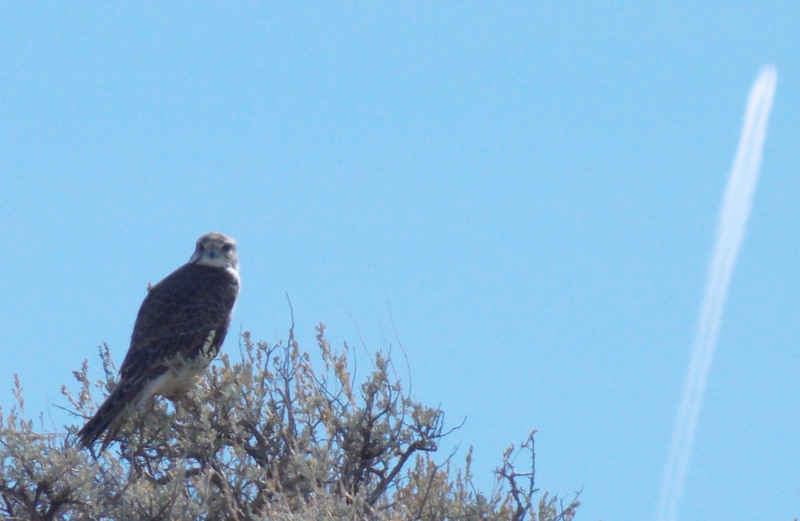 After I few minutes of watching it, I realized it was a prairie falcon and Eric paused while I snapped photos. Click on this photo to get the best view. This photo is interesting, not only because the falcon shows well, but because a jet happened to create a vapor trail to enhance the shot. We didn’t get every antelope we went after in fact there was a miss or two. Here’s a video clip of one of the misses. Just click on the link. 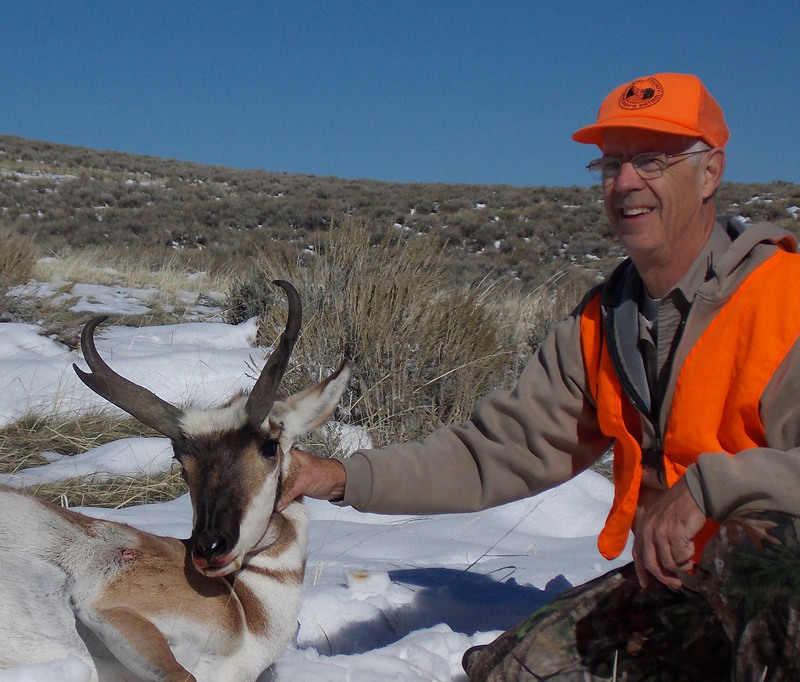 Day two ended without another pronghorn, but we still had a day to go. Eric had other commitments for day three, so he hooked us up with his father, Greg, who was a real good guy. We enjoyed his friendly, enthusiastic and easy-going style. 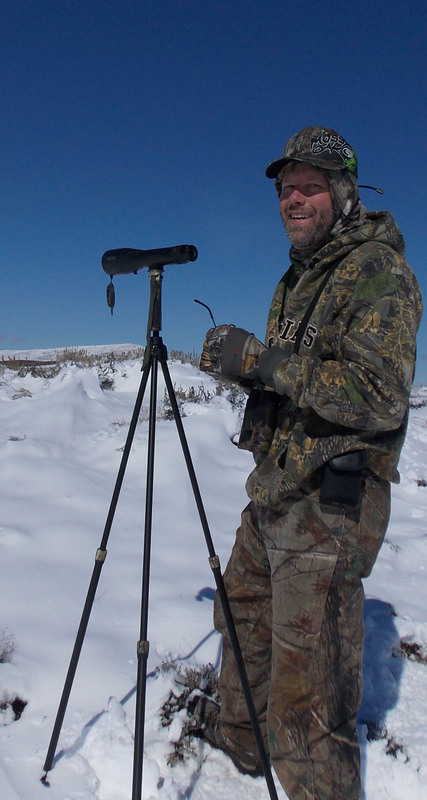 He told us a few stories about his sage grouse adventures, and it wasn’t long before we found one of his flocks. 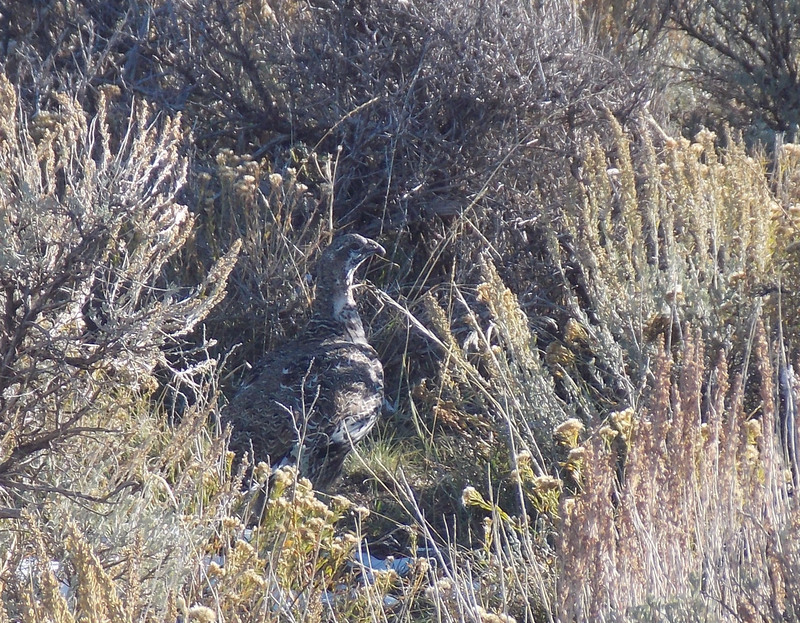 We saw a couple flocks of grouse. They weren’t very wary. At the first property we went to, we ran into antelope. Ken had a couple close calls and then the whole herd ran by us and stopped just inside 200 yards. Ken knocked the dominant buck down, but by the time we got to the spot, he was on his feet again. What ensued was a two-hour track and stalk job that ended with Ken finishing the buck off from 169 yards. It proved out to be the best buck of the trip. Ken knocked this one down at 169 yards. This buck has impressive mass and great cutters. Had a great trip to Colorado. Hunted with Big Rack Outfitters, Eric and Keri Hamilton. They were charming hosts and took great care of me. Bunked in their cabin with two other hunters, Ray Sherman and Ken Craft, from Dayton Ohio. We all filled our tags with nice bucks. Not enough time to go into detail, so I’ll start by attaching photos of our bucks. More later. Ken bagged the nicest buck of all on the last day. Lots more to talk about and photos to share later. 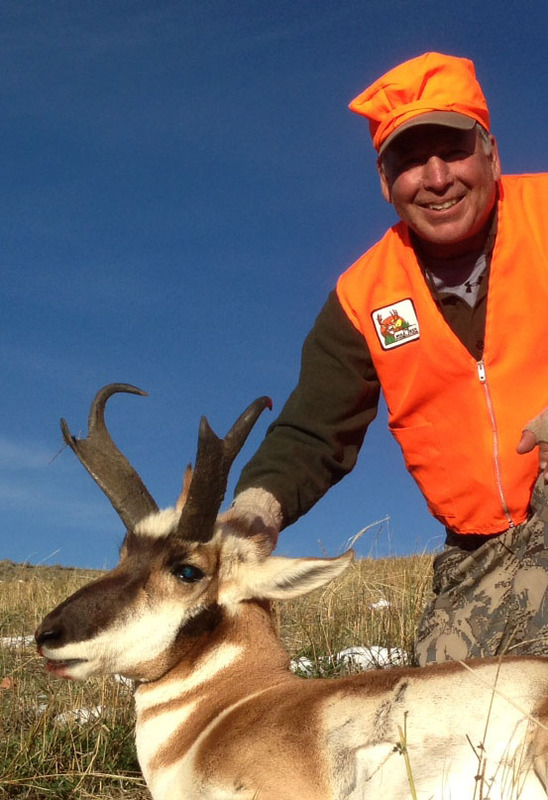 Big Rack Outfitters guides for deer, elk and antelope on private lands in Northwestern Colorado. For detailed info go to http://www.bigrack.com. I’m heading to Colorado this afternoon. Tomorrow I’ll be looking for my first ever pronghorn antelope. Seems hard to believe that I’ve never killed a pronghorn. I’ll be back on Wednesday and hopefully able to post some nice photos of pronghorns and maybe even photos of one that comes home with me. I’ll be flying into Steamboat Springs and hunting with Big Rack Outfitters. We’ll be hunting close to the Wyoming border.